We ran a usability survey in the fall that included an open field for comments. These comments are invaluable to get a reality check on how the website is serving our visitors. And the comments were plentiful. Like most of our other work, the web team is not the business owner for different areas of the website, so the insights from these comments need to be easy to share. Standard spreadsheet tools just weren’t cutting it. I needed a better way to manipulate the data into views that could be shared with our colleagues. No need to overwhelm them with a spreadsheet of everything. Never send a spreadsheet by email again. Ever. Airtable has a pretty basic template for capturing survey comments, but it was a little too basic for our needs. Luckily, they also had a more detailed blog that described their process for analyzing comments. 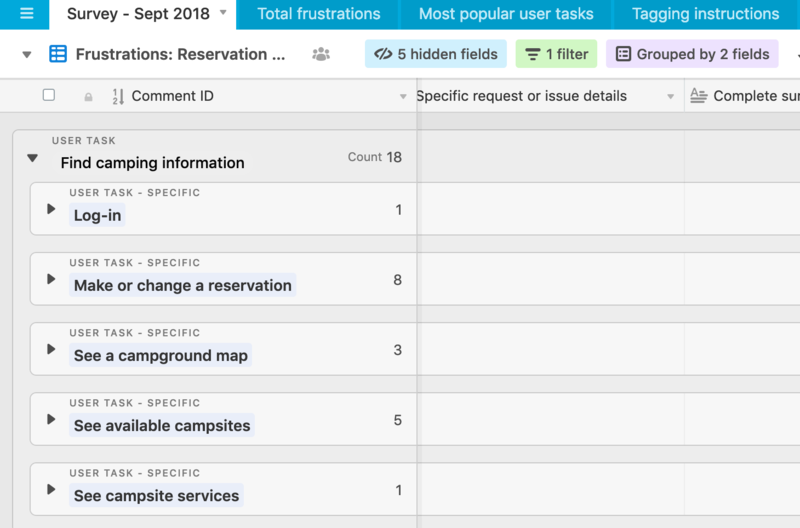 In that blog, the author tagged comments by frustrations and top tasks. Amazing. That’s exactly what I needed to communicate our findings. Being our first UX survey, we had to start from scratch when deciding how to tag the comments. Our initial ideas for tags (before reading all of the comments) ended up being way off. They were too simplistic and not aligned with WHO needed the information. It sounds so easy in retrospect. But it was challenging to narrow down the exact labels for the frustrations and tasks. At a glance, we can now easily see the top frustrations by tallying all of the comments for each frustration. These are easy to find on their own tab. 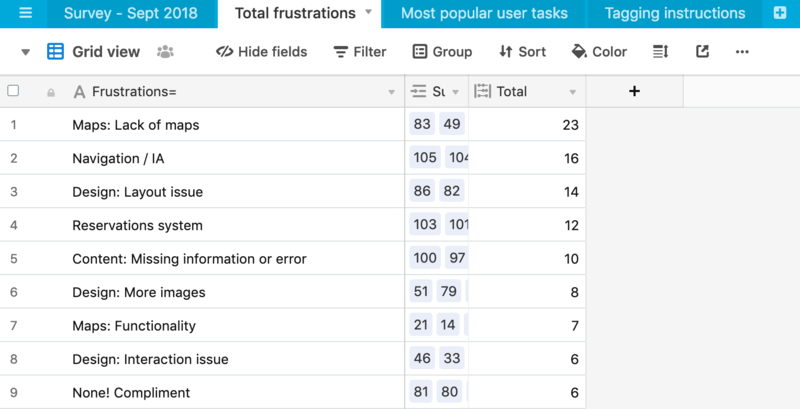 Sample of frustrations – using the ‘count’ field type to autosum all frustration tags. Tasks were the hardest to accurately capture. There were often sub-tasks for several topics, like finding a camping site. Finding a campsite involves several steps: search for a site, see a picture of the site, find availability, reserve, and change a reservation. These were all really important to capture, so the reservations team can comments for each part of the process. I know our colleagues always appreciate when we make their jobs a little easier. Here’s an example of how we could manipulate the data based on tags to produce a business line specific report. A sample business line report – filtered by tags. The last tag was the easiest – tagging the section of the site referred to in the comment. Some sections of the website have different business owners, so these tags makes it easy to sort and share the comments. The last part of this work involved documenting the tagging strategy. This is especially important if others will be helping to tag the comments. I added a tab in the Airtable with a link to the instructions in Google Docs.